Spices give flavor to our food, it adds the character and soul to a dish. The subtle combinations of various spices makes the dish unique. Imagine a curry without garam masala - there is nothing to it. Cooking is all about knowing your ingredients, so you can use it to create magic in the kitchen, it is not rocket science. Spices are not only paired for flavor, but sometimes they are paired so you can get health benefits from it. Like pepper and turmeric, turmeric has better absorption when paired with pepper. I had a choice between posting the lemon n' blueberry tart or finish up my spice post for March. 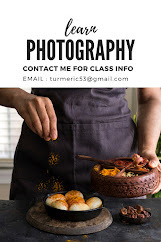 I had already shot turmeric for a brand, so I had the images but I had to shoot the other two and finally took time off and made the other two images. I just enjoy photographing spice, probably the most therapeutic exercise for me. Nothing exotic or dramatic, just plain and simple images. The cheese cloth in the first picture is dyed from turmeric. 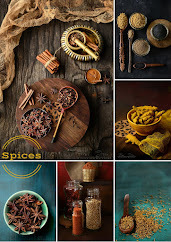 If I dream of something, it is not a big studio, or large brands to photograph, but to style and photograph spices all day for a spice store. I'm an eternal dreamer and optimist to the point of being irrational sometime, I'm sure I'll get to a spice store one day...till then I have a good collection of spices in my pantry to work with. Spice is a bit like us, each one having a intrinsic character and potential. Put it in the right combination and you have a winner. Turmeric is also know as Indian saffron. 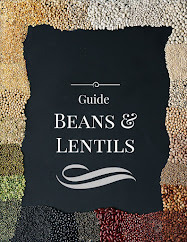 It has been documented to have been used in Vedic culture (1750–500 BCE). Marco Polo, while on his several legendary voyages to India via the silk route, was so impressed by turmeric that he had mentioned it as a vegetable that possesses properties of saffron, but actually is not saffron. It’s quite a well traveled historic spice. It's not just used for culinary purpose, probably best known for the bold yellow color it gives to curry. In ancient India it was used as a dye for clothing and threads for centuries. It's also on the list of ingredients for many cosmetic creams and soaps - great for skin care with anti bacterial properties. 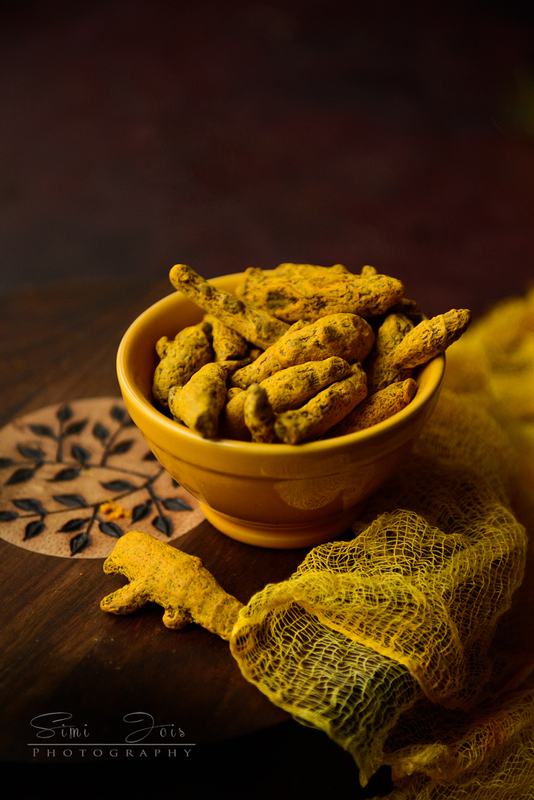 Haldi (turmeric) and kumkum (also made from turmeric and dried lime) has a deep significance in Hindu and Buddhist culture. It symbolises fertility and prosperity, purity and a spiritual connection. The deep yellow is associated with Sun and abundance. Lots of research has been done over the years and modern medicine has somewhat embraced this magic-spice. Less is more, too much of it may make the dish bitter. Turmeric is always paired with pepper for better absorption, so make sure you pair it with pepper. If you are looking for ways to incorporate this in your daily life here are some recommendations. Salad dressing, a pinch of turmeric to salad dressings. 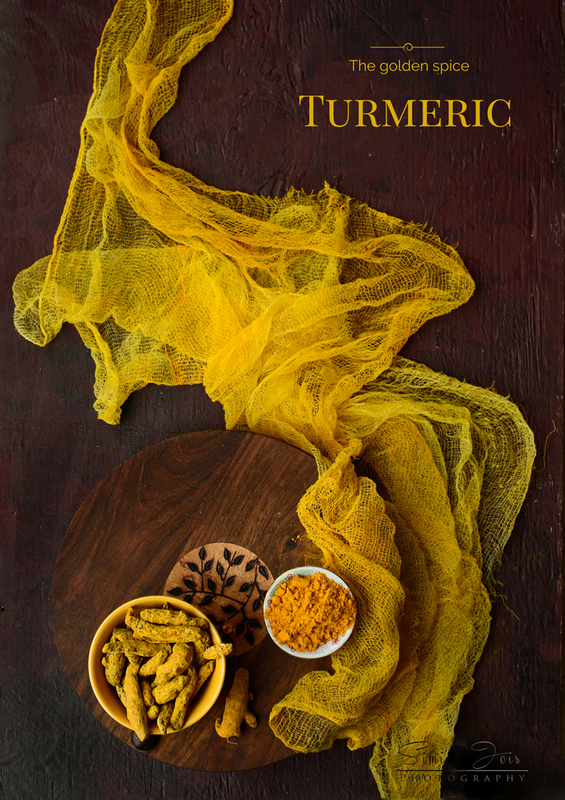 Fresh turmeric root to your tea or smoothie. Marinate your meats with pinch of turmeric along with other spices. 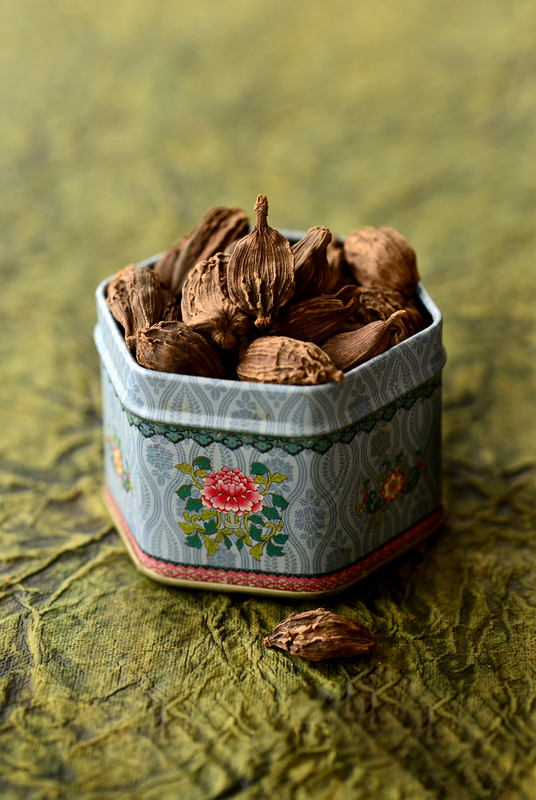 Cardamom is a spice that originated in Western ghats in Southern India. It is probably one of the most aromatic spices. Used as a breath freshener by Egyptians and in perfumes by the Romans. It's an expensive spice - second to saffron, it also pairs very well with saffron. The black cardamom is a relative of the green but most certainly very different flavor profiles. While the green is sweet and delicate, the black is smoky and bold. I will not substitute one for the other. There are three varieties of cardamom, Green, black and Madagascar . 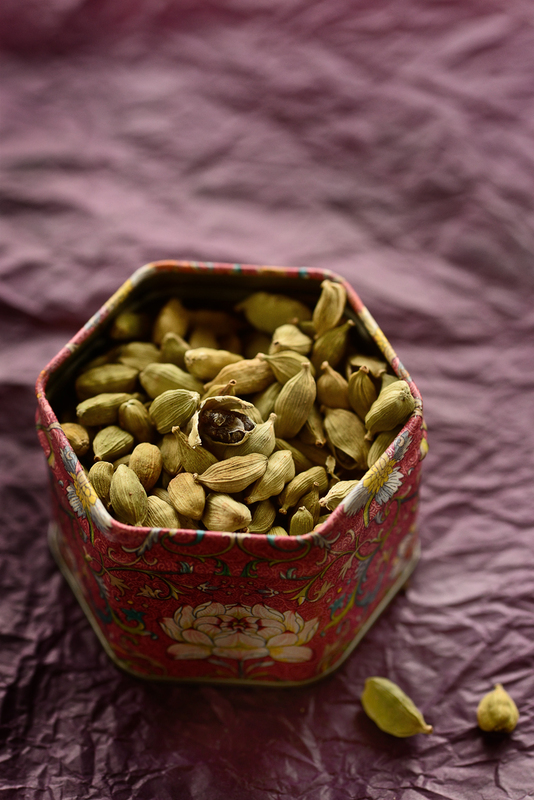 The cardamom pods are as aromatic as the seeds inside, use the pods in your tea. While the green cardamom is more popular in desserts, the black cardamom is mainly uses in savory curries. It is also the aromatic spice used in garam masala. The heat that you feel on the back of your throat after you have eaten a warm Indian curry is probably from the pepper. There are six varieties of pepper, but since I had only three and one of them not a real pepper but an impostor. 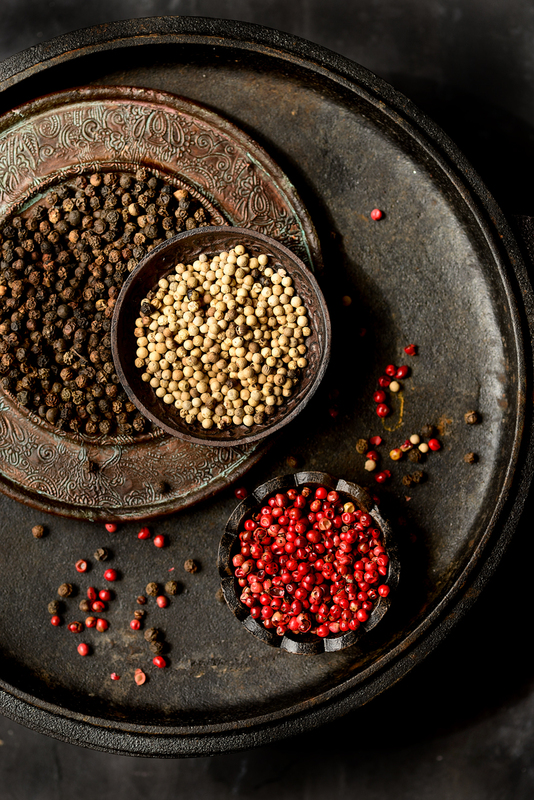 Black pepper is the strongest of all and is called the Malabar black if it was cultivated in the Malabar coastal region. While the other variety Tellicherry is grown on Mount Tellicherry. Black pepper is made from dipping the green pepper in boiling water to break the cell wall and then dried. However in some cases they might be just sun dried without boiling them. White peppercorn is the black pepper corn without the dark skin on it, it is milder in flavor. The ripe red pepper corn are soaked in water and the outer shell removed. Red Peppercorn The actual red pepper corn are ripe pepper that are usually preserved in brine or vinegar. However most red/pink pepper corn sold are not really pepper but are berries. It must be used with caution as it can cause sever allergic reaction in some people. When you pair black pepper corn, make sure you use very very little of it, probably just 2-3 seeds or just the skin - it is very strong. 1- Potley method : sometimes whole spices are tied in a muslin cloth - potley. It is dropped into the curry and cooked, after the curry is made the potley is removed, the curry has the flavors of all the spices. 2- Spices are dry roasted and ground into a spice blend that are used in the dish. 3- Whole spices are roasted in ghee and used in the dish. 4- Whole spices are blended with tomatoes and or onions or coconut into a chutney and used in the dish. 5-Spices are roasted in oil/ghee and added just before serving - as a seasoning. 6-Spices are boiled in water and a decoction is made, usually in jams, pickles, breads or infused beverages. Lovely clicks! This is a spice I use a lot. I'm in love with all the clicks. I love the pepper picture, looks like a picture from a famous magazine - you should apply for them.